Even in post-modernity, there is such a thing as right and wrong. The Civil War was about deciding who counted as one of us and what rights, privileges, and duties we would afford each other. It was not a foregone conclusion that America would denounce slavery as unconditionally wrong. Into this arena steps Asa Mahan. 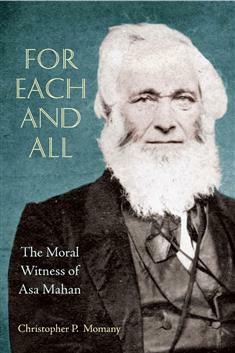 Asa Mahan was an abolitionist, college president, author, and clergyperson who advocated that there is intrinsic value in every human being, and for our country to honor its covenant with its citizens, all must actively engage differences peacefully with justice and hope. Using primary source material, Momany helps us rediscover the moral and philosophical waters of antebellum America from which Asa Mahan drew his religious convictions and crafted his moral principles. The author also shows how Mahan informed and interacted with leaders like Frederick Douglass and Abraham Lincoln.